China's passenger-car sales surged 84 percent last month as government stimulus measures and an economic rebound spurred demand. Sales of cars, sport-utility vehicles and multipurpose vehicles climbed to 1.015 million, the China Association of Automobile Manufacturers said. Car sales also jumped 90 percent in August thanks to a 4 trillion yuan ($ 586 billion) stimulus package, including support for auto sales, designed to shield China from the worst of the global slowdown. General Motors Co, the largest overseas automaker in China, more than doubled September sales from a year earlier to 181,148 vehicles. In the first nine months, it sold 1.29 million, surpassing the tally for the whole of 2008. 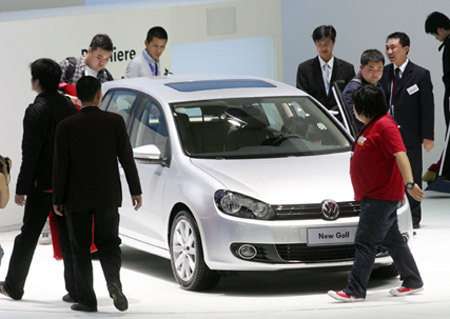 Volkswagen AG boosted nine-month China sales to 1.06 million vehicles, beating the 1.02 million it sold in the whole of 2008. China's biggest automaker, SAIC Motor Corp, also said sales were racing ahead, up 47 percent in the first nine months from a year ago. In January, China's auto market overtook the United States as the world's largest. Analysts said the loose money policies that have propelled the industry are set to continue at least till the end of the year. "Auto sales rely heavily on policies, just like the stock market. It's hard to predict the sales outlook for next year as we don't know whether the government will renew the tax cuts for small cars after they expired at the year end," said Qin Xuwen, an analyst with Orient Securities. "If they indeed cut sales tax on mid-range sedans next year as many hope, it could be another bumper year ahead." All of China's publicly traded domestic car makers are likely to give some outlook for the rest of the year when they report third-quarter results in the next few weeks. But regardless of how they end the year, companies are likely to see their sales growth cool down in 2010, said Ji Junfeng, an analyst with Changjiang Securities. "They're not likely to see a repeat of the explosive year-on-year growth in car sales in 2010 as the comparative base will be much higher," he said. "It's true that government policies have helped push up auto sales this year, and weak demand in 2008 also played a role in it." The strong growth has also turbocharged profits and shares for Chinese automakers, which are required by the Shanghai Stock Exchange to announce if their profits will rise or fall by more than 50 percent in any given period. SAIC did just that, saying yesterday its net profit for first nine months of the year jumped more than 70 percent. Chongqing Changan Automobile Co, a Ford Motor partner in China, also said its third-quarter net profit was estimated between 267.2 million yuan and 327.2 million yuan, reversing a net loss of 106.64 million yuan a year earlier. SAIC shares have nearly quadrupled this year, while Changan's Shanghai-listed shares have more than tripled and Dongfeng's shares are up 58 percent. Geely's Hong Kong-listed shares have tripled over the year to date, including a 7 percent jump yesterday to a nine year high after it reported its September car sales doubled.